Metito, a global provider of intelligent water management solutions, is set to stage real-time demonstrations of water technologies, at this year’s Dubai Solar Show which opens next week. The show is being held as part of Water, Energy, Technology, and Environment Exhibition (Wetex), the largest event of its kind in the region and one of the biggest specialised exhibitions in the world. Underlining its strong commitment to consistently develop sustainable water solutions bridging the gap between water supply and demand, Metito is participating for the second time at the event. During the upcoming event, Wetex will be introducing and performing live demonstrations for a number of pioneering sustainable water tech solutions, ranging from engineered membranes to water quality monitoring systems, all focused on offering more sustainable and eco-friendly alternatives that can be partially or fully powered by solar energy, as a value added proposition. ‘Biopipe’, the world’s first fully in-pipe biological wastewater treatment technology, will be on display. This is a patented technology and is the only system in the world that can recycle wastewater without creating any waste by-products. The treated water is completely safe for use in organic farming, irrigation, underground aquifer injection, discharging into lakes, rivers or sea, or alternatively it can be stored in clean water tanks for later usage. Biopipe can be operated with solar energy, depending on the capacity of the plant. The technology was most recently utilised by the Sharjah City Municipality Agriculture and Environment Sector which celebrated the launch of the first-of-its-kind eco-friendly sewage treatment plant in the region, utilising Biopipe a few months back. Developed in collaboration with Optiqua Technologies, Metito is also introducing ‘EventLab 2.0’, another patented technology that provides online and sample-based water quality monitoring through utilizing an award-winning optical ‘Lab-on-Chip’ sensor technology. This will be demonstrated live at Metito’s stand at Wetex. The technology is the solution of choice for applications where real-time, continuous and, sometimes remote monitoring of the overall stability of the water quality is crucial. 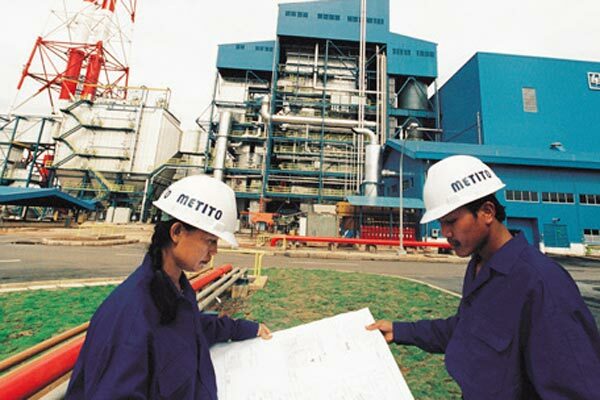 Metito will also feature its new product ‘Metito 4’ that integrates advanced sensing, instrumentation, fluid handling, and data communications technologies to bring the most sophisticated cooling tower and boiler controller services in the water treatment industry. The simple, intuitive programming makes it easy to control multiple cooling towers, boilers, closed loops, or virtually any water treatment process. Metito managing director Fady Juez said: "This year we celebrate Metito’s 60th anniversary, and all through the years we have been at the forefront of our industry through our innovative water solutions and technologies. It is our belief that new, more advanced technologies can revolutionize the water industry particularly in water poor nations or less economically developed countries with basic water infrastructure." "The ultimate goal we strive to achieve is to enhance the sustainability and efficiency of our water solutions whilst reducing power usage and wastage to a minimum throughout the water cycle," stated Juez. The Dubai Solar Show is a business-to-business platform to establish networks, build partnerships and share insights about the latest solar-energy technologies among the public and private sectors. "Bringing customised cutting-edge engineering and technology innovations to our clients and projects is the only way to tackle the systemic issues of water scarcity around the world," he noted.